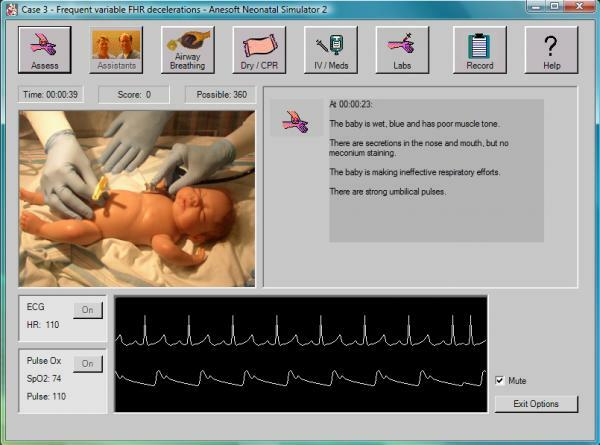 The Neonatal Simulator v.2 Package incorporates two modules - Neonatal Simulator 2 for real-time neonatal resuscitation simulation and Writer to help you write your own case scenarios. This easy to use package contains the most recent American Heart Association Neonatal Resuscitation algorithms, medications and dosages. A colorful graphic interface, automated record-keeping and an on-line help system create a unique and realistic training environment. Assess the patient, control the airway, breathing and circulation, and administer cardiac medications. Topics cover: 12 Simulated Cases, Normal delivery, Fetal heart rate decelerations, Severe fetal bradycardia, Meconium-stained, Meconium aspiration.